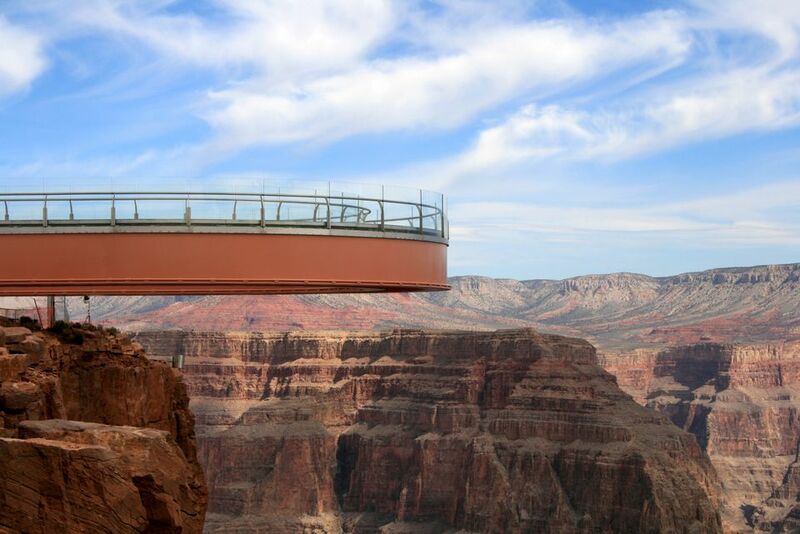 Grand Canyon West and the Skywalk prices and other information for visitors are important for those who want to make their visit to the Hualapai Indian lands attraction a memorable one. And it is a wonderful experience for many people. Visitors can step onto the Skywalk, look through a glass floor and see the base of the canyon about 4,000 feet below, for example. If this sounds like a good time to you, you'll want to plan your trip down to the last detail, from getting there to how much you can expect to pay. Since the opening of the Grand Canyon West Skywalk, the world now knows about Grand Canyon West and its unique beauty. However, confusion about how to get there is common. First, it's important to know that the location is not near the ​Grand Canyon National Park South Rim or North Rim. If you are flying to the Southwest, select either the Phoenix Sky Harbor Airport (PHX) or the Las Vegas Airport (LVS). Grand Canyon West is accessible from Peach Springs via freeway and the infamous Diamond Bar Road. 14 miles of Diamond Bar Road are graded and maintained and about a third is now paved. RV’s will not be able to use that road. We recommend using the Park and Ride Coach Service for visitors driving RV’s and other low-lying vehicles. If you do that, you will park at the Grand Canyon West Welcome Center on Pierce Ferry Road which is one mile past Diamond Bar Road. Please call to reserve your round trip seat on the Park and Ride service. There is a nominal fee for either driving and parking your own vehicle or parking and taking the bus. Once you reach the airstrip terminal, you can purchase a package to tour Grand Canyon West. You cannot buy a ticket to just the skywalk; it must be purchased as part of a package. Check the Skywalk website for up-to-date pricing and package information. You won't be able to take personal effects out on the Skywalk as if visitors dropped things, the sensitive plexiglass would soon be scratched. Visitors are asked to store all personal effects in lockers. There is a professional photographer on the walkway and those photos are available for purchase in the visitors center. Winter hours of operation are 8 a.m. to 6 p.m. As daylight extends, you will find the closing time extended. The summer hours effective May 1st are 7 a.m. to 8 p.m. Of course if you have purchased an overnight package, you will not have to leave and can enjoy Hualapai Ranch on the canyon rim. Before you start your journey to Grand Canyon West, whether it be from Las Vegas or the Phoenix area, decide what you want to do and see, think about how long you can spend and review literature on package trips and flights. Since driving to this remote area is not easy right now, many have signed up for helicopter trips, small plane tours or other packages. Some opt to stay at Grand Canyon West. These trips must be planned for and some are rather pricey. Here are some options (there are many others):. Westwind Aviation - Westwind flies out of Deer Valley-Phoenix Airport. They have a fleet of single engine turbo-prop Caravans, very sturdy and reliable planes. We flew courtesy of Westwind to the Grand Canyon West Skywalk Grand Opening. They offer a package charter to Grand Canyon West. The Adventure Tour is priced between $480 and $525 per person. On this 7 hour tour, you can fly over scenic Arizona and the canyon, picnic at Guano Point, and tour the Skywalk and the Indian Village. Your pilot also serves as guide once you arrive at Grand Canyon West. What sounds really exciting is their Perspectives Option. This includes a 10 minute helicopter experience down to the floor of the Canyon, a brief walk to the river’s edge, a 15 minute smooth water pontoon boat ride on the Colorado River, with towering cliffs above you, then 10 minute ride back to the top and reconnect with the pilot for the 1.5 hr. ground tour above, before the return flight to Phoenix. Air time to Grand Canyon West from Deer Valley Airport is only 1 hour. The Airport is conveniently located off I-17 just north of the I-101 interchange. Let's say you drive to Grand Canyon West on your own, arrive at the airstrip terminal which serves as the entry to the area, and want to tour and see the Skywalk. While you don't need to reserve a walk on the Skywalk ahead of time, you should call and reserve your tour package ahead of your visit. You have some options. The most important thing to remember is that you must purchase either an outside or on-site tour package to see the Skywalk. There is no entry to the Skywalk without purchasing an entry package or tour. Hualapai Ranch - Hualapai Ranch offers a wild west experience with cowboys, western shows, opportunities to go horseback riding and old fashioned western meals. You can stay overnight at the ranch. You can also stay at the ranch, for corporate retreats and group experiences. Inquire via their website. Hualapai Lodge - the lodge is located in Peach Springs, capital of the Hualapai Tribe. It has a lobby with large fireplace, clean and basic rooms. The Diamond Creek Café offers American foods, including hamburgers and sandwiches along with specialties such as Hualapai tacos. They have a pool and gym, laundry facilities. Address: 900 Rte. 66, Peach Springs, AZ, USA. After visiting Grand Canyon West and the Hualapai people, peering over the canyon's edge and experiencing the thrill of flying into the airstrip over beautiful Arizona canyon lands, I have to say the prices, which appear high on first glance, are worth it when you consider the importance of tourism to the Hualapai people. The Skywalk and the tourist facilities at Grand Canyon West represent the dreams of the Tribe for a financially secure future. All the Tribe has are these beautiful lands. In order to make money, this impoverished Tribe must find a way to use the land. They have chosen to open their lands and hospitality to the world and thus ensure a future for themselves and their children.